I live near Louisiana so that means it’s always a perfect time for etouffee. Bam, y’all! For those of you new to etouffee, it’s typically a seafood stew that’s served in New Orleans and area. I’ve seen shrimp etouffee and sometimes a crawfish version. Like many Southern comfort foods, there’s a hint of veggie with a lot of glugs of oil. I decided to swap things around and turn my etouffee on its head – lots of veggies and just a tiny glug of oil. 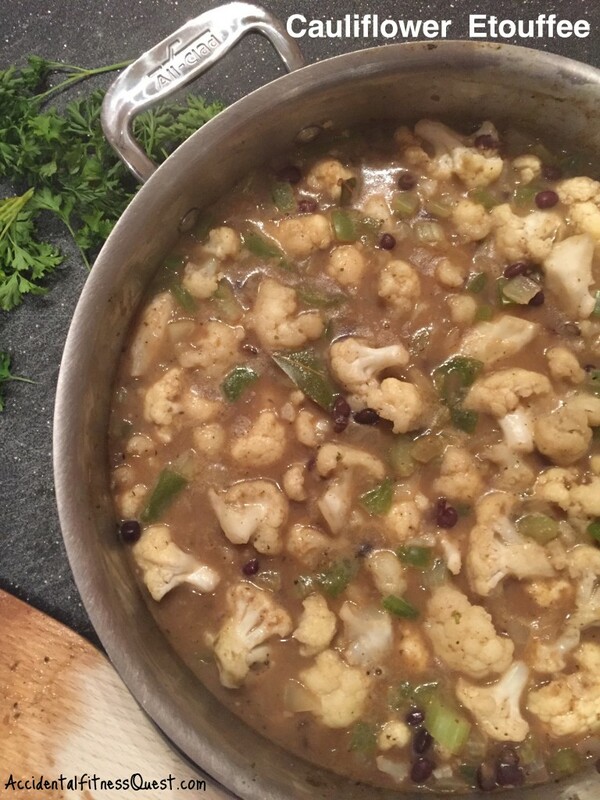 Just like my Tikka Masala, cauliflower plays a starring role in my Cauliflower Etouffee. It’s a great way to get your veggies in for vitamins and volume, keep calories down, and enjoy some good old fashioned comfort food. It’s also one of those recipes where you don’t have to be exact and can use amounts and ingredients that you’ve got. Don’t stress over how big medium or large is. Just dice and eyeball the veggies into portions that look good to you. I’ve listed the approximate amounts I used, but feel free to use more or less. You can also use different beans if you don’t have kidney beans. I’ve used adzuki beans, red beans, pinto, and black. Go for it and make it your own! Heat a large pot over medium heat and add the olive oil. Swirl pan to coat the bottom and add the onions, celery and green pepper. Saute on medium for about 5 minutes until the veggies soften. Add the garlic and spices, and stir for about 30-60 seconds just to toast the spices and soften the garlic. Pour in the water. Push the veggies slightly to one side and add the flour while whisking with a fork or whisk to avoid lumps. Once the flour is incorporated, stir to blend. Add the bay leaves and cauliflower florets and cover. Simmer until the sauce thickens from the flour and the florets soften. This will take about 10 minutes but check on it and add a little more water if the sauce gets too thick before the cauliflower is done. Stir in the beans and cook just until they’re heated. Remove from heat and divide into bowls. Garnish with the fresh parsley. Makes 4 servings at approximately 200 calories each – 10g protein, 35g carbs, and 5g fat. If you don’t have Cajun spice which is a blend, don’t run out and buy some just for this recipe or the leftovers might end up dying a slow death in the back of your pantry. You can easily make your own with common spices. For the 2 tsp of Cajun seasoning, mix 1/2 tsp dried oregano, 1/2 tsp dried basil, 1/4 tsp dried thyme, 1 tsp paprika, and a pinch of cayenne pepper. Make your pinch of pepper as small or as large as you like based on spice tolerance. I used a teeny tiny bit since I was making dinner for me and The Kid. I tasted next to no spice at all and she kept blowing her nose. LOL! So your mileage with spicy pepper may vary. To round out the meal, add in a protein of choice. You can go with traditional cooked shrimp or give grilled chicken or ground turkey a try. Afterall, it’s etouffee your way!